For over a year Humax's superb FOXSAT-HDR has been the only Freesat PVR on the market, but other brands are now providing a bit of healthy competition. Among them is the Grundig GUFSDTR500HD, which offers an alternative way of watching and recording Freesat's growing number of free HD and standard-def channels. Inside this gorgeously styled unit sits a 500GB hard disk, which enables you to record up to 125hrs of hi-def or 312hrs of standard-def broadcasting, which is a lot more than the Humax's 320GB hard disk can hold. The key to the Grundig's flexibility lies in the inclusion of twin DVB S2 tuners, which enables you to record one channel while watching another – surely the most important capability of any PVR – or record two simultaneously. You can even watch a recording from the hard disk while two channels are being recorded, but you can't watch a third live channel. The unit's most exciting socket is the Ethernet port, which until now has always been designated 'for future use' on all Freesat products. But thanks to the recent launch of the BBC's iPlayer on the Freesat platform (albeit in beta trial form) this socket will soon enable you to watch BBC programmes online. The beta is currently only available on the Humax FOXSAT-HD and HDR, but when it's rolled out this box is also ready. A USB port on the back is available for uploading software updates, but sadly, multimedia playback from Flash drives is off limits on this model. 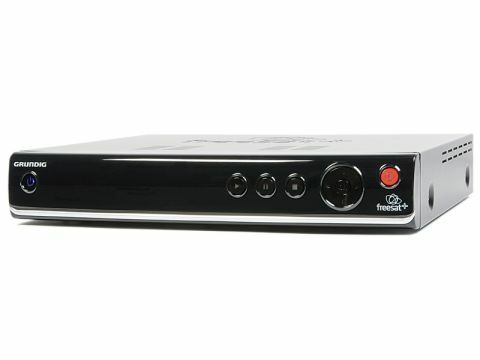 Also on board is a full set of 'Freesat+' features, including Series Link, Split Recording and a system of excellent dialogue boxes that warn you when recordings clash and suggests alternative broadcasts. Grundig has provided a no-nonsense, intuitive user interface, which makes operation a breeze. Neither overly fussy nor flash, the various menu screens are clean and accessible, with judicious use of colourful graphics and large text. The structure keeps submenus to a minimum and it's quick to respond to remote commands. Channel tuning is over in a flash and you get a useful summary of all the TV and radio stations it's found. There's a non-Freesat mode, which searches for other free-to-air channels available on the Astra satellite, but these only appear in the channel list and not the EPG. The latter keeps faith with the grid structure familiar to Sky+ users, showing eight channels at a time. The genre tabs, programme synopses and colour-coded instructions are tidily arranged around it without feeling cluttered, but it doesn't leave room for a mini screen showing live TV. Setting Series Link should have been easier. After setting the programme to record from the EPG, you have to move to the Recording Library and apply the Series Link option there. Not a deal-breaker perhaps, but a pity given the attention to detail elsewhere. Managing your recordings is a breeze thanks to the terrific Library menu. Live TV plays in a small screen at the top and all the recordings are listed by name below. Hitting the Preview key plays the recording in the small screen, which is a useful function for checking your recordings. This screen also acts as the timer schedule, listing upcoming recordings at the bottom. It's also pleasing to note that the unit is speedy in operation and the entire array of functions are still available when two recordings are in progress. The only operational sour note is the bizarrely laid out remote, whose channel change, EPG and Library keys are placed far too low for comfort. The Grundig's picture quality is hard to fault. Standard-def channels such as BBC One and ITV1 have plenty of depth and detail in the pictures, but most importantly the machine keeps a lid on mosquito and block noise, which can be distracting. In fact, the picture seems a little cleaner and fractionally less twitchy than the Humax's. The Grundig's recording quality is equally impressive: we couldn't see any difference in quality between the live broadcast and the recording. Moving to HD pictures, the leap in quality is immediate and striking. There's a depth, crispness and lucidity to high-definition material (particularly on BBC HD) that still gives us goose bumps despite having seen the broadcast format in action a million times, and the Grundig's pristine pictures perfectly preserve that sense of wonder. It doesn't matter whether you're listening to TV programmes through your TV or piping the signal digitally to your AV receiver, the sound on offer is eminently enjoyable. Speech is clear and prominent during news and chat shows, for example, but more exciting content such as movies or dramas are powerfully relayed. Your average Freeview PVR typically sets you back around £150, which makes the Grundig seem rather expensive. Even the Humax FOXSAT-HDR, with its superior feature list can now be found for less, making this unit look dear. This can be partially explained by the Grundig's bigger 500GB hard disk, but that's still not enough to stop the Humax looking like the better-value option. That said, if you do opt for the Grundig you won't be disappointed: it's smart, user-friendly and delivers excellent picture quality.